We’re really excited to launch our new killer video tutorial package: Web Design For Small Business! The Web Design For Small Business Package is specifically designed to teach business owners EVERYTHING they need to know to run a professional website for their business. 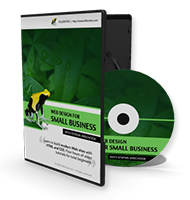 This is the first video tutorial package geared specifically for small business. With over 27 hours of training, spanning over 160 video tutorials, you’ll get training from experienced web designers who KNOW what is required to build and manage your commercial website. In addition, you get nearly 2 hours of podcasts where Stefan Mischook teaches you what to look for and how to make the right decisions when creating a website for your business! For more information and some sample videos, check out the Web Design For Small Business Package. You can also take a look at our other packages at the Killer Video Store! This entry was posted on Thursday, January 13th, 2011 at 11:24 am	and is filed under Business of Web Design, News. You can follow any responses to this entry through the RSS 2.0 feed. Both comments and pings are currently closed.